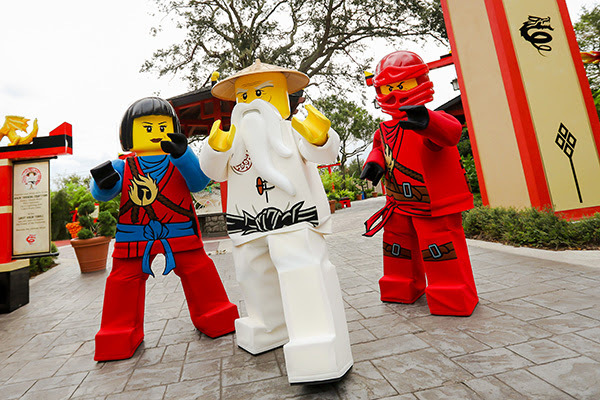 LEGO NINJAGO: Master of the 4th Dimension is an all-new 4D attraction at LEGOLAND Florida Resort in Winter Haven, Fla. This exciting new theatrical experience combines dazzling 3D computer animation with 4D real-world effects as Lloyd, Kai, Jay, Cole, Zane and Nya must find their way out of a mind-bending dimension filled with eye-popping visuals. See it daily in the Wells Fargo Fun Town Theater! “LEGO NINJAGO: Master of the 4th Dimension”: Opening Jan. 20 – all-new “4D” attraction! This exciting new theatrical experience combines dazzling 3D computer animation with “4D” real-world effects as ninjas Lloyd, Kai, Jay, Cole, Zane and Nya must find their way out of a mind-bending dimension filled with eye-popping visuals. See it daily in the Wells Fargo Fun Town Theater! LEGO NINJAGO Days: Jan. 20-21, 27-28, and Feb. 3-4 – all-new event! Celebrate your favorite ninja heroes with exclusive in-park activities and meet-and-greets with Kai, Nya and for the first time ever – Master Wu! Then become the ninja in LEGO NINJAGO World, where kids can do battle against familiar foes like Lord Garmadon and the Great Devourer aboard LEGO NINJAGO The Ride. The Great LEGO Race will transform the existing “Project X” roller coaster at LEGOLAND Florida Resort into an exciting, high-octane experience that puts kids in the driver’s seat and asks, “Are you brave enough to face, race and beat the best of the best in all of LEGO world?” Opening Spring 2018 at LEGOLAND Florida Resort in Winter Haven, Fla. The Great LEGO Race: Opening Spring 2018 – new virtual-reality roller coaster adventure! The wildest LEGO race ever imagined combines cutting-edge virtual reality technology with roller coaster thrills in an exhilarating new attraction that will transform the theme park’s existing Project X ride into an all-new adventure starring a wacky cast of LEGO minifigures. Learn more at www.LEGOLAND.com/the-great-lego-race/. Brick Dash 5K*: Saturday, April 14 – family event returns! The popular, long-running 5K family event returns under the new sponsorship of Visit Central Florida, benefitting Merlin’s Magic Wand, the global children’s charity of LEGOLAND parent company Merlin Entertainments. Additional information and registration details will be announced soon. KIDZ BOP Weekend – second year of exclusive concerts & meet-and-greets! The KIDZ BOP Kids return to rock the park with three days of high-energy concerts, including the debut of their official theme song for LEGOLAND Florida Resort, “Awesome Awaits.” Plus, fans will enjoy exclusive meet-and-greets with the coolest kids around – Ahnya, Cooper, Freddy, Isaiah, Julianna and Sierra! Stand by for an announcement about 2018 dates! LEGO® Star Wars™: The Force Awakens MINILAND Model Display: Opening May 4 –giant new models! Join us as we unveil the newest addition to our LEGO® Star Wars™ MINILAND Model Display. Created with thousands of LEGO bricks, the display features memorable moments from Episode VII of the popular Star Wars™ saga enhanced with lights, sound effects and animation. LEGO® Star Wars™ Days: May 5-6, 12-13, 19-20 – bigger than ever this year! Enjoy our huge new LEGO® Star Wars™ display in MINILAND USA as we celebrate a record three weekends of fun from “a galaxy, far, far away”! Activities include meet-and-greets with LEGO Darth Vader and – new! – a LEGO character from “The Force Awakens” and “The Last Jedi,” hands-on LEGO® Star Wars™ building activities and much more. Fourth of July – a red, white & blue salute to America! Celebrate America’s independence on Wednesday, July 4 as we light the skies above Lake Eloise with one of our biggest fireworks shows of the year! Before the sun goes down, help us create a giant U.S. flag out of thousands of LEGO bricks. Brick or Treat: Select dates in October – seventh year of lightly frightful fun! Our popular Halloween event returns full of spooky, kooky LEGO fun for kids. The friendly-not-frightening event features trick-or-treating inside the theme park, giant LEGO models and photo ops, LEGO build activities, meet-and-greets with LEGO Halloween characters and an exclusive, themed fireworks spectacular in Pirates’ Cove. Christmas Bricktacular: Select dates in December – have yourself a merry LEGOLANDChristmas! Our annual holiday celebration returns to deck the halls with a 30-foot-tall LEGO Christmas tree lit several times each evening in a brilliant combination of twinkling lights and classic yuletide music, festive decorations and photo ops, including a giant LEGO wreath and a life-size LEGO Santa, reindeer and sleigh, plus holiday-themed scavenger hunts with cool LEGO prizes and hands-on LEGO building activities for kids. Meet LEGO Santa and LEGO Toy Soldier during daily park appearances. Kids’ New Year’s Party: Select dates in late December – our popular party has grown! Our multi-day party invites kids to move and groove at a high-energy dance party, set fun goals for the year ahead and go on a special scavenger hunt in MINILAND USA before ending the night with an amazing fireworks show over Lake Eloise. Then on Monday, Dec. 31 only, ring in the new year with our traditional before-midnight “brick drop” and an even bigger fireworks spectacular. *With the exception of the Brick Dash events taking place Saturday, April 14, all events listed above are included with all forms of theme park admission – and annual passes. No extra ticket required! Awesome Pass – a year of unlimited admission to LEGOLAND Florida Theme Park and LEGOLAND Water Park. Awesomer Pass – all the benefits of the Awesome Pass, plus a year of unlimited admission to The Coca-Cola Orlando Eye, SEA LIFE Orlando Aquarium, Madame Tussauds Orlando and Atlanta’s LEGOLAND Discovery Center, as well as theme park parking and more. Awesomest Pass – a year of unlimited admission to more than 30 Merlin Entertainments attractions across North America, including LEGOLAND Florida Theme Park and LEGOLAND Water Park, and much more. Extend the fun with an overnight stay at our popular on-site accommodations – the 152-room LEGOLAND Hotel and the 166-room LEGOLAND Beach Retreat. Both feature whimsical LEGO theming inside and out, a breakfast buffet included with your stay, complimentary Wi-Fi, heated swimming pools, plenty of places where kids can play and easy theme park access. For rates, availability and room-and-ticket package offers, visitwww.LEGOLAND.com/vacations. LEGOLAND Florida Resort features more than 50 rides, shows and attractions inspired by popular LEGO and DUPLO brands, including awesome experiences based on “The LEGO Movie™,” “LEGO NINJAGO: Masters of Spinjitzu,” LEGO NEXO KNIGHTS™, LEGO City, LEGO Technic and LEGO Friends, plus the seasonal LEGOLAND Water Park. The multi-day vacation destination is located just 45 minutes from Orlando and Tampa, in Winter Haven, Fla.
For more information about savings on advance purchase of admission tickets, park hours, field trip programs, services for guests with disabilities, VIP experiences, teacher passes, military discounts and much more, visit www.LEGOLAND.com/florida. Previous story SeaWorld San Diego’s October News!